As we mentioned on TCND #084, our local public school system “celebrated” Bring Your Child to Work Day. 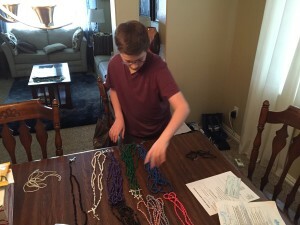 Since this opportunity only applied to our youngest two sons, I agreed to let them both stay home and work with me processing rosaries for Rosary Army. 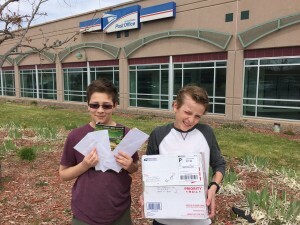 RosaryArmy.com is the main ministry that I have the privilege of managing from the basement office of our home and these boys only know life with rosaries in it. Not a bad thing in my opinion. First stop was the post office. It’s always a fun surprise when we check the mail and find all three types of mail inside: envelopes containing rosary requests, donations and more all-twine knotted rosaries to inspect and prep for distribution. It’s a great reminder for me to be thankful for these individuals in my prayer life. 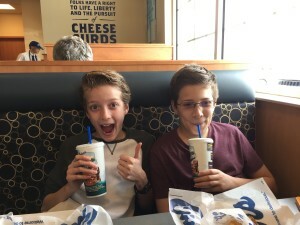 Before the massive inspection of nearly 1000 rosaries could begin, I figured I’d better boost their morale and treat them to a “business lunch” at our local burger joint. Gotta have fuel for the journey. And truth be told, the Reuben wasn’t half bad. Not New York good, but decent. 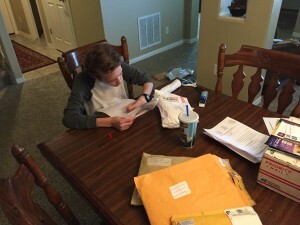 Tommy is hard at work filling out the quality inspection paperwork for each batch of rosaries submitted. He caught on super fast. Not bad for an 11 year old! 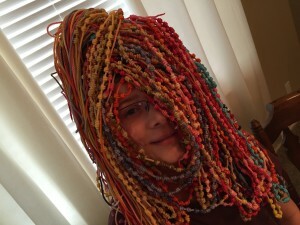 No, these are not rainbow dreadlocks on Ben’s head. One of our hardworking rosary makers decided to have a little fun with tie-dye and Ben decided to have some fun with her creative work. 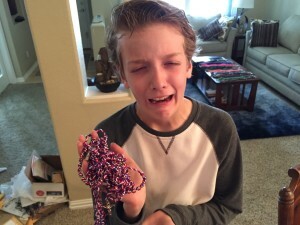 Who says rosaries can’t be fun! Our Lady Undoer of Knots where are YOU!!! Yikes! There were at least 10 rosaries tangled up in this ball of rosaries. I tried to think of Our Blessed Mother as Tommy handed this giant knot to me to untangle for him. It gave me a chance to meditate on how us mammas have the skill and patience to untangle knots in our kids’ lives. After several hours of intense rosary sorting work, it was finally quitting time for this Bring Your Child to Work Day. 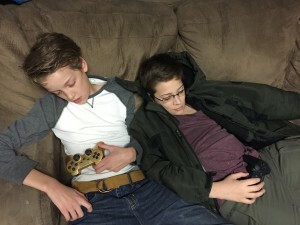 For their reward, I dismissed them to the basement for some much deserved R&R time with video games. Or maybe just plain ol’ R&R.